Passing Great Yarmouth's Beach Coach Station this afternoon I noted four coaches present enjoying the sunshine. Two were from National Holidays in the form of Setras NH14HBH and NH11NTH, whilst the others were employed on Alfa Travel contracts. These comprised Commercial Coaches' Volvo B12B PO59FHY and Grayways' Van Hool integral TX15 YJ66FKA. 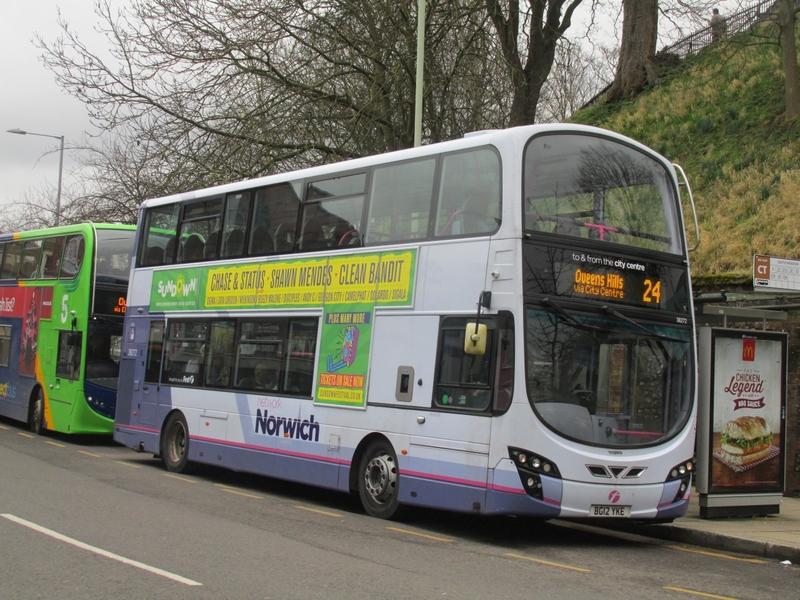 The next former Yellow Line Vehicle from Norwich to gain a new Lilac front is Volvo B7TL 32107 LT02ZCX. Pictured above at Simon Morris in Ipswich after its transformation on March 29th, Below is my photo of it on the 24th at work in Norwich in its former colour. Many Thanks to Mark for the Photo. Its Been a while since i have had the camera out in Lowestoft to catch up on things even though i work there aswell! Mark Doggett visited on the 29th of March and has kindly sent me a selection of photos to share. 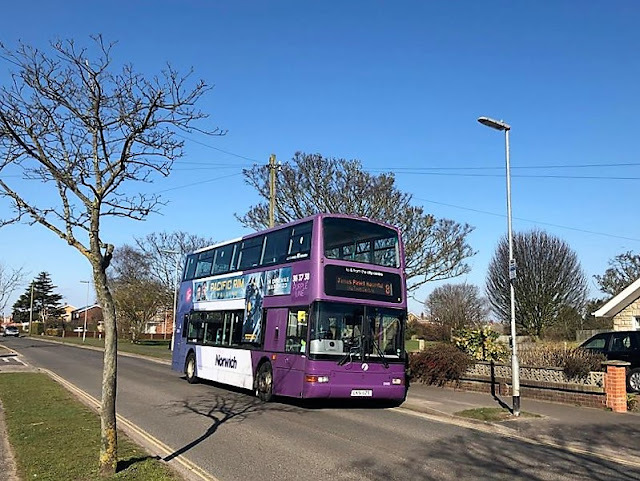 First up is Heritage liveried 30888 W743DWX seen here in Katwijk Way heading out to Southwold on the 99 service. One of the recent Enviro 200 arrivals from Slough is 44531 SN62AZW, pictured in Gordon Road entering the Bus Station retrning from Norwich on the X22. Well travelled Enviro 200 44517 YX09ACY has now found a home in Lowestoft after previous lives in Ipswich and Norwich, it still retains its Charcoal front from its Ipswich days, seen here in Kessingland on the 99 service. Finally we have one of Great Yarmouth's former Greenline Geminis, 32348 LK53LZL working the 1 serrvice in from Martham, it is the only one of three that gained standard livery, the other two are in Excel Blue colours (37274/5). Many Thanks once again to Mark for use of his excellent Photographs. Wright Eclipse Gemini bodied Volvo B9TL 37569 AU58ECN is now back in service after receiving a new gearbox. The move of similar 37574 AU58ECY to Lowestoft now appears to be permanent. I received a notification from @fpp5t on twitter yesterday to say that Sanders Coaches have acquired another coach.. 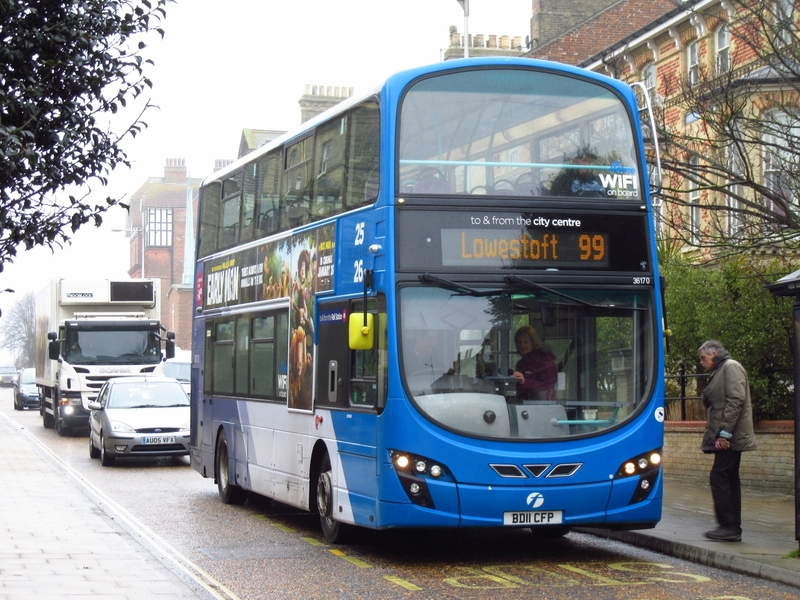 He tells me that it is a Plaxton Elite bodied Volvo B9R with the registration SA60TWP. It was previously with Parks of Hamilton where it carried the registration KSK953. Built to National Express specification, it features a lower front destination display. Today's Notices and Proceedings Report provides details of approval to two applications by Paul Frost to vary existing services under short notice. The services affected are the 62 between Snape and Woodbridge plus the 62/65/71/72 from Orford to Woodbridge. New routes and timetables are effective from 9th April 2018. Also included in the publication are notifications on replacement services being provided by West Norfolk Community Transport in the Kings Lynn area from 30th April 2018. Noted working in Lowestoft this afternoon was Norwich based Gemini 36170 BD11CFP, it was working the 99 service between Lowestoft & Kessingland, i managed to grab a photo whilst on my lunch break in London Road. A quick Sunday lunchtime trip around the usual haunts which began with a look in at the First Great Yarmouth depot with Excel liveried 37274 LK58EDF posing outside. Inside the depot was First Norwich Blue Line 36170 BD11CFP no doubt ready for staff to carry out MOT/inspection in the morning. Meanwhile, in the rear yard was two of the three Dennis Trident/Plaxton Presidents which came from First South West to assist with Bernard Matthews contract work late last year. Both 32801/49 T801/49LLC haven't seen use for some time being reportedly withdrawn. It is believed the third is languishing at Lowestoft's Gas Works Road depot. It had been a while since I had ventured to Norwich with the camera hence the reason we have had a few guest posts recently keeping us all up to date with all the goings on. 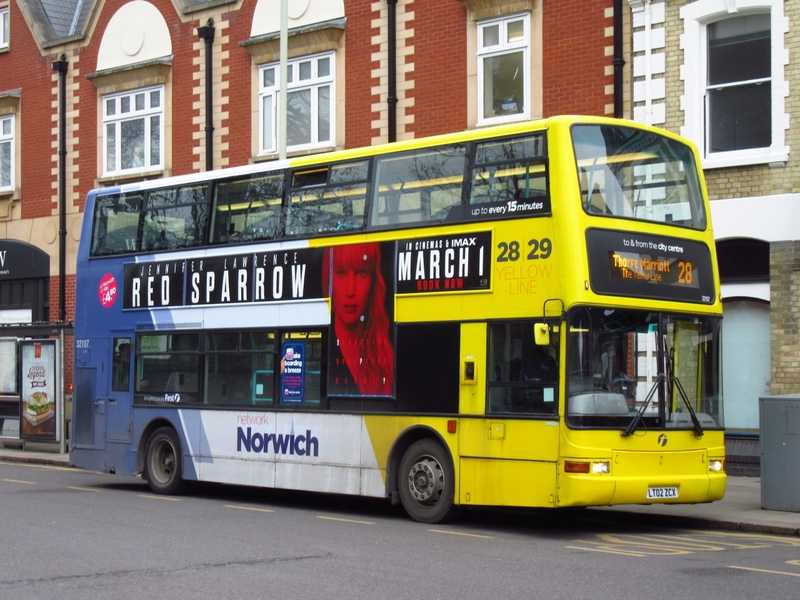 I was hoping to catch up with the recent repaints we have reported and all the new branding that is being applied to the First Norwich Fleet. You can imagine my delight when a very bright looking Gemini pulled into Castle Meadow. 36265 BG12YJX is a recent arrival from Leeds and has gained the new Yellow Line livery for the 28/29 and new X29 service which begins on April 4th. It was being used for Shuttle duties and not in service, perfectly placed for a few photos!. Another recent arrival is 32670 BG12YKD, It was working the 24A service and I caught up with it in Theatre Street, this should remain in standard livery. 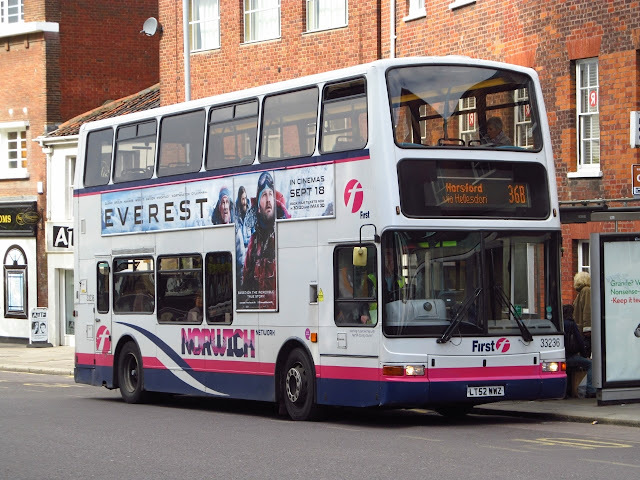 Another recent repaint we reported earlier in the week was 33167 LR02LYF, now in the new generic Lilac fronted livery to serve all routes, yesterday working the 24 to Thorpe St Andrew. The remainder of the day i will leave to Roy who i bumped into in Castle Meadow and he was also armed with the camera and he will carry on the sightings. Thanks for the above Grahame and just three more observations to report with the first being the use of ex Anglianbus Scania OmniCity YN05HFF on Postwick Park & Ride for most of the day. I then wondered along St Stephen's Street and found two former First Yarmouth buses on Charcoal Line duties; StreetLite 47505 SN64CPZ was passing Volvo B9TL 36181 BF12KXU as I took my photo. My final picture was the catch of the day as far as I was concerned. I know that Stagecoach sometimes provide deckers for their X29 services between Fakenham and Norwich but on this occasion Alexander Dennis Enviro400 10055 SN13EEB arrived especially branded for the Hunstanton to Kings Lynn service. An interesting day overall in that I didn't spend much (!) and surprisingly saw former blogger Kieran Smith on his first controller duty for Konect - still living the dream no doubt! A Couple more updates to report from Norwich, former Yellow Line President bodied Volvo B7 32105 LT02ZCU has returned to service in its new Lilac identity and was noted today working the 36 service. And another ex Leeds Volvo B9TL is now in service in the shape of 36272 BG12YKE and was out and about working the 24 route. Continuing our Ipswich-based theme, I received an email from Paul Bennett during yesterday afternoon. The photo was taken by friend Rob Freeman at the Simon Morris premises on Tuesday. Paul says the reason for the delay in sending it was that First had still not seen the new look and given it the ok.
My thanks to Paul for sending the photo and to Rob for taking it. 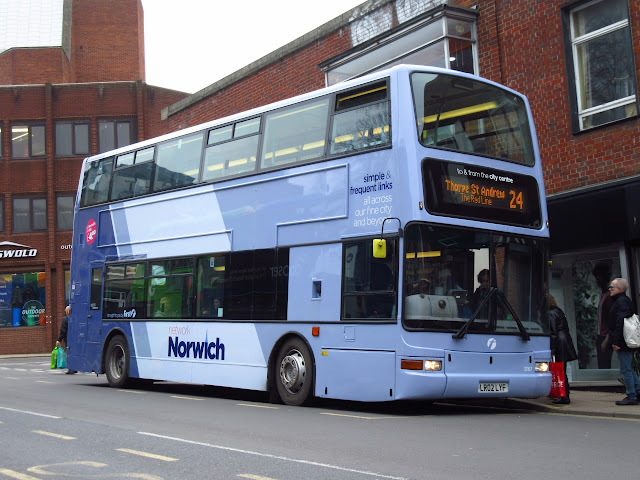 Jordan Watson has been in contact and provided a lengthy report on recent happens in the Ipswich Buses fleet. Unfortunately I am unable to repeat the full report here but these I consider to be the main points. Firstly, Jordan tells me the Scania OmniCity deckers are coming in thick and fast from Hants and Dorset Trim with 17 buses now confirmed to be converted to single door. The influx will mean that the last remaining Tridents due to go include 12 (LG02FDC), 13 (LG02FDF), 16 (LG02FDN), 20 (Y436NHK) and 22 (LR02BBJ). Remaining will be 7 (LX03BTF), 8 (LX04FYB), 25 (SN51 AXP) and 26 (LR52 KWH) - three ‘Carters’ buses and one an Ipswich town server. MCV Evolution 156 (AY60BVD), previously with Carters, has been repainted and smartened up for full time town service work. It is mainly seen on the 13 with the occasional service 12 or 8. It wears the new refined green and purple livery with the white vinyl strip along the sides. 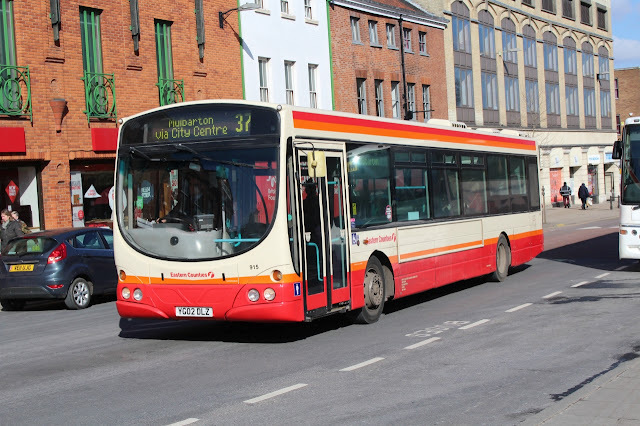 A few strange allocations have been reported by Jordan over the past week including Optare Versa 146 (YK08EPC) appearing on the decker dominant 15 and 15a service - although this was only for a brief morning spell. Other noted workings comprised Dart Sprytes 93 and 98 both appearing on 6 and 2 after both seemingly being expelled from town to constantly run on the 97 to Shotley. Optare Excel 170 (YG52DGO) made one single trip on the new service 7 to Anglia Retail Park before returning to 9/10 work. What will be Scania 45 (YR61RVE) was seen on Carters service for a week still in London specification and livery. However, this has now been sent off for conversion. Finally, Jordan provides details of some buses 'that are not playing nicely' which include Optare Solo 244 (YN53ELW) which was seen being towed back to the depot last Friday afternoon and has remained there since. It is now sitting on 'old crocks row' next to DAF 58 (PJ53OLA) which has been SORN and out of service with a mechanical issue. Solo 243 (YN04LWJ) has also been off the road for some time with its future uncertain although its still taxed. My thanks to Jordan for his extensive report illustrated by his own photos. The blog is always pleased to receive topical reports with supporting photos. Contact details for each software platform can be seen in the left hand column on this page. 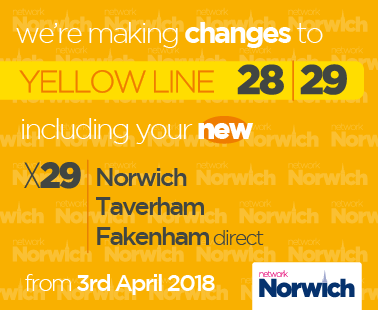 From the 3rd of April First begin to operate the X29 service between Fakenham and Norwich. The route was previously operated by Stagecoach. 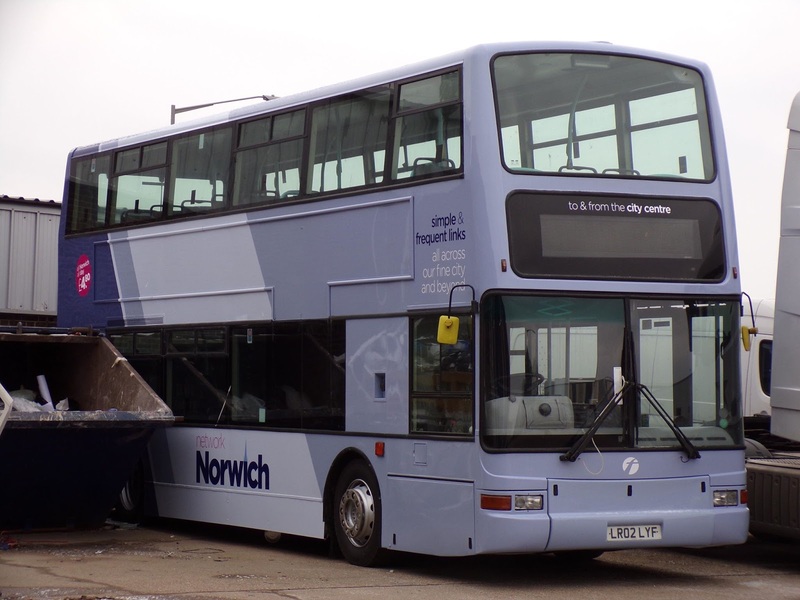 Four of the Recent Volvo B9TL arrivals from Leeds are being revamped to serve the route and the first vehicle to be treated made its way back to Norwich yesterday from Simon Morris in Ipswich. 36265 BG12YJX is pictured above in its new Yellow fronted livery in the winter sun. 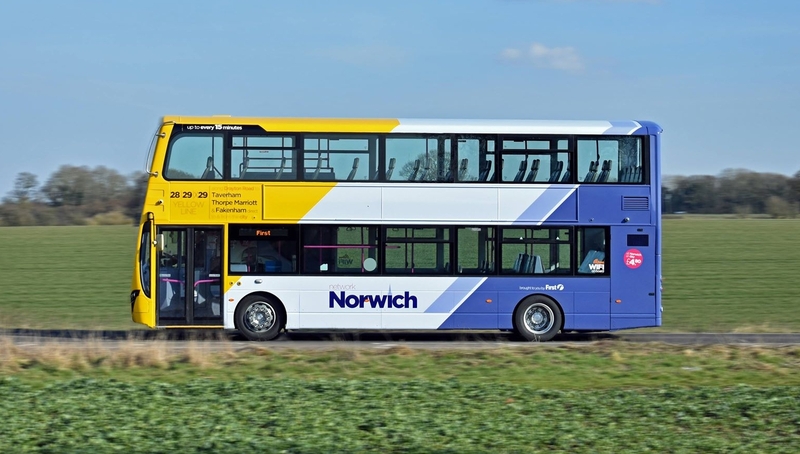 36266 & 36268 are curently at Simon Morris in Ipswich to recieve their Yellow livery whilst former Yellow line liveried Volvo B7TL 32105 is also there to gain the new generic Lilac front for any routes. Many Thanks to Zak Nelson for his excellent photograph. 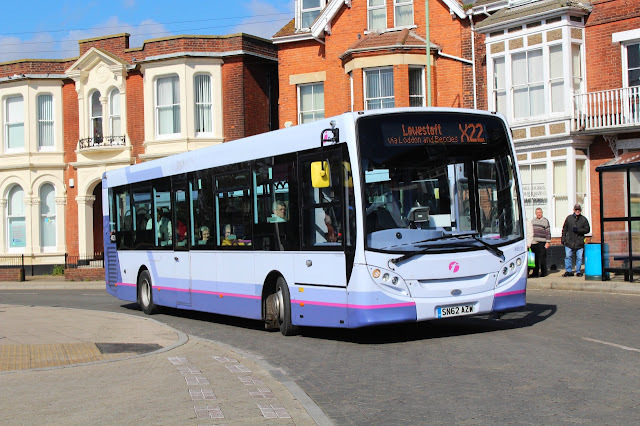 Following the partial completion of work on the A47 Lowestoft Road in Gorleston, First Eastern Counties has gained retrospective consent to amend the route and timetable of service 9 between the James Paget Hospital and the town's Market Gates plus services 8/8A/8B between the hospital and Caister's Marram Drive. 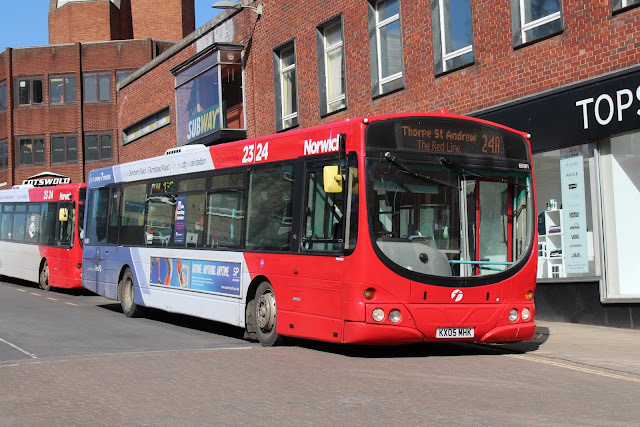 Sanders Coaches is to amend the timetable of its 43/43A/43B Reepham Market Place to Norwich Bus Station route from 29th April 2018. Amid all the Winter Weather the sun did shine in Norwich yesterday and Mark Doggett was out and about with his camera and has kindly sent us a selection of First Norwich vehicles enjoying the bright conditions. First up is recent Volvo B9TL arrival from Leeds 36270 BG12YKC, seen here heading towards St Stephens at the top of Castle Meadow. Heritage liveried Volvo B7L 60915 YG02DLZ is pictured in the same location working the Purple Line 37 service to Milbarton. On to Theatre Street where we see Red Line liveried Volvo 66981 KX05MHK awaiting passengers for the 24A service to Thorpe St Andrew. Finally we see Kings Lynn based Enviro 33808 YX63LJO heading out of the Bus Station heading for Peterborough. 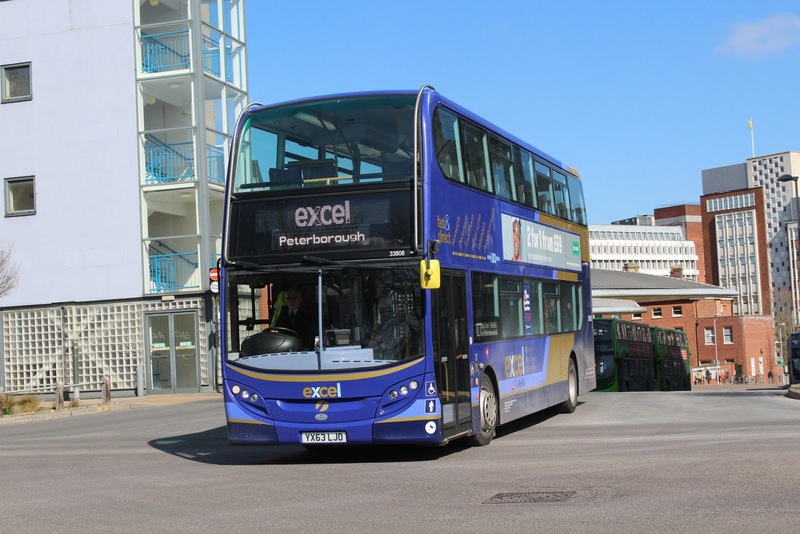 This part of the route has been renamed XL or Excel whichever you prefer and the bus has now been fitted with new branding for the service and updated Screen displays. Many Thanks to Mark for his excellent photographs. It was Purple Line branded Dennis Trident 33003 (LK51UZS) which is seen above heading for the Hospital. My thanks to Will Drake for the photo. 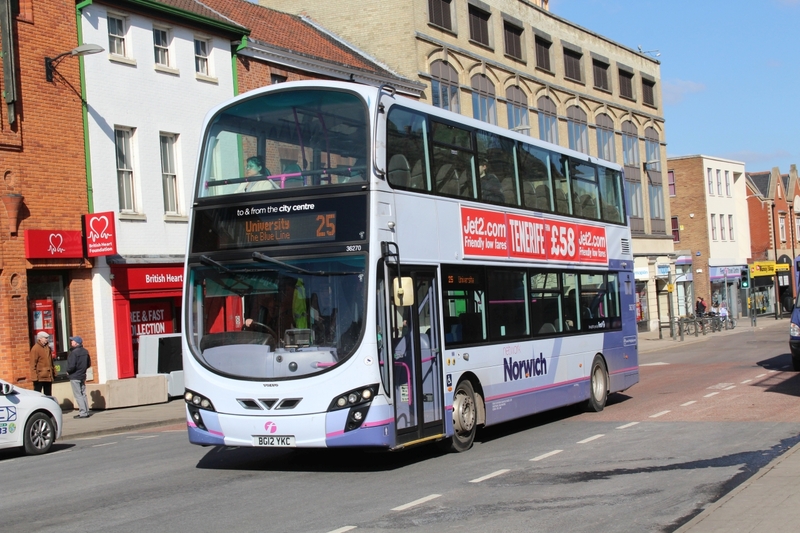 The First Trident from the Norwich fleet has been given a makeover into the new generic Lilac fronted livery for vehicles available for all routes within the city. 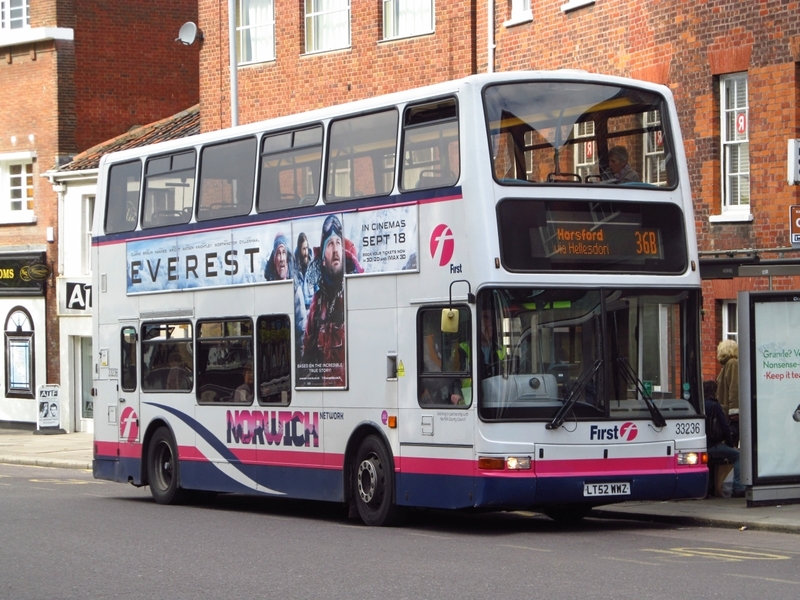 33167 LR02LYF has lost its Turquiose front in favour of the new colour at Simon Morris in Ipswich. 33167 recently carried an allover advert for Adsa over the Christmas period and was stood down from its Turquiose line duties and moved to the 36/37/38 services. Above it is pictured in Castle Meadow back in 2015 shortly after gaining its first new look away from standard Barbie livery. Many Thanks to Bryan Dickson for use of his photos at Simon Morris. 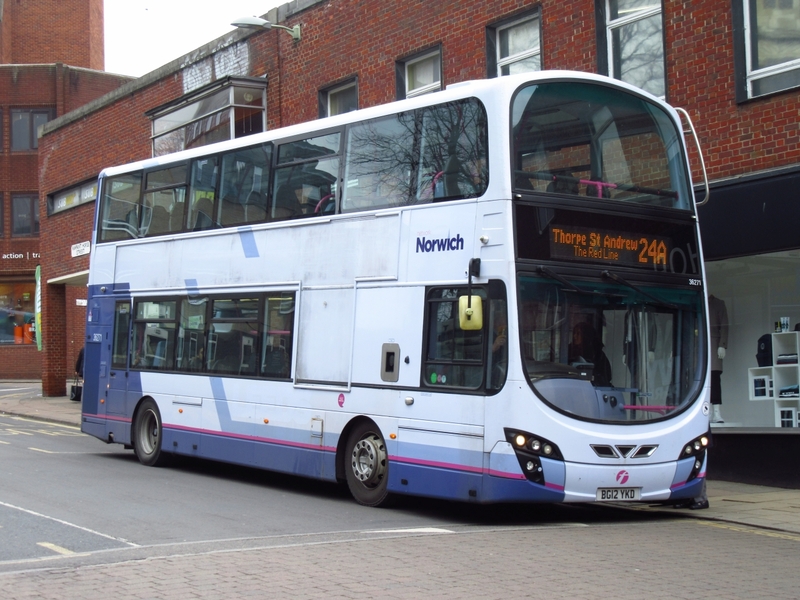 First Norwich are now expecting a further two Wright Streetdeck vehicles for their fleet. The vehicles are coming from First Bristol in the shape of 35149 SN65OMT & 35150 SN65OMU. 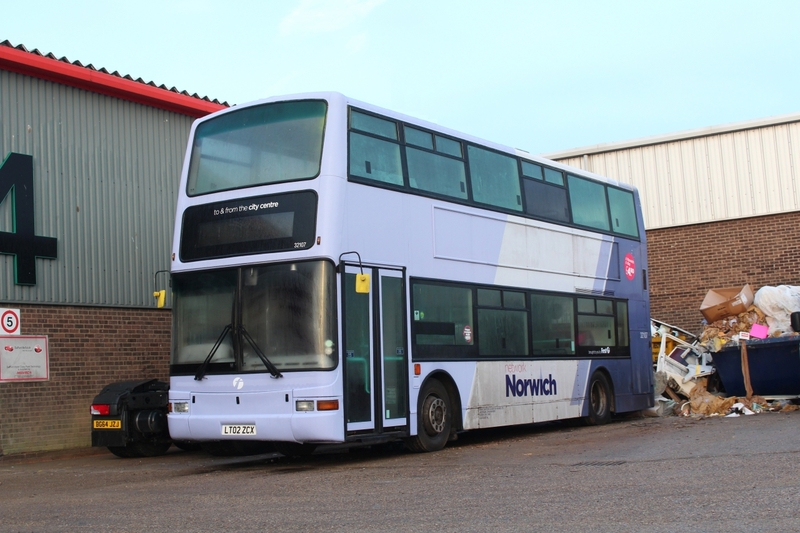 Both carry Lilac fronts, a colour that will also be used on more Norwich vehicles in the coming weeks as the fleet upgrade continues. Both vehicles have now transfered down to Cornwall for Rail Replacement work prior to heading up to Norfolk. Thanks to David Oakley for the photo and Chris Speed for the information at First. Following the previous report on Crosville Motor Services workings in Weston super Mare, I also have put a post together of other operators' workings observed in the resort. First West of England appear to provide most of the bus services in Weston with them using a variety of liveries. They included an Excel branding for the X2 to Bristol and an Airport Flyer livery for the service to Bristol Airport. 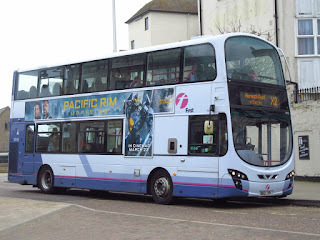 Another operator of interest was Citistar which provides a small number of services in the Weston super Mare area. The photo shows it operating local bus service 4 to Hutton on a contract gained from North Somerset Council in September 2017. On one of the days we walked back to my niece's house, we came across this red liveried Olympian parked next to St Paul's Church on Wallscote Road. 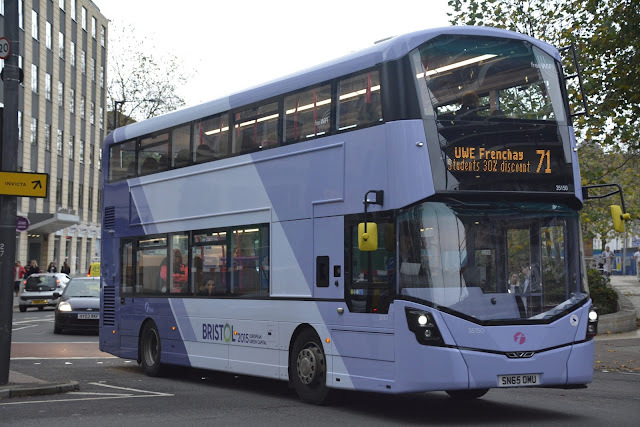 The former First Bristol Northern Counties Palatine bodied Volvo was acquired in 2014. 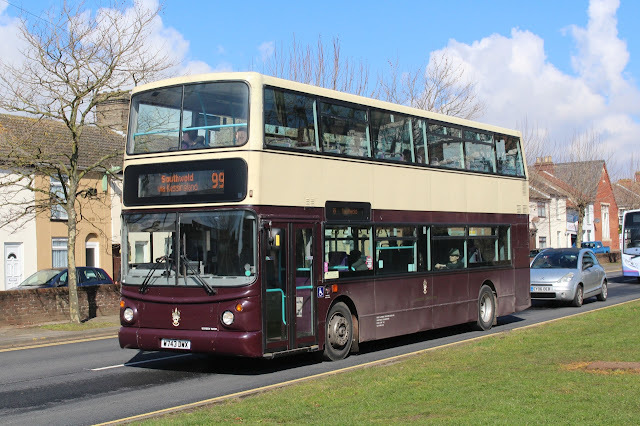 Although new to Bristol in December 1997, R663NHY also saw use with First Cymru. It was used on outings but with its 'carer' at St Paul's moving on it is now static and mainly used by the youth club. An interesting time observing activity with photos taken over the two days appearing shortly on our Flickr site. CMS has taken the decision with some regret which 'was simply because the market is too challenging with passengers numbers falling and competition fierce'. The operator is part of JJP Holdings South West and employs 10 full time and 11 part time staff plus casual workers. It runs a 24 strong fleet. JJP Holdings also owns a heritage fleet which will be used on the final day; these are being retained by the holding company. Therefore, I had to put some time aside to get some photos of Crosville vehicles in service during my short stay. Yesterday's Notices and Proceedings Report contains a 'bumper bundle' of changes to services in our local area. 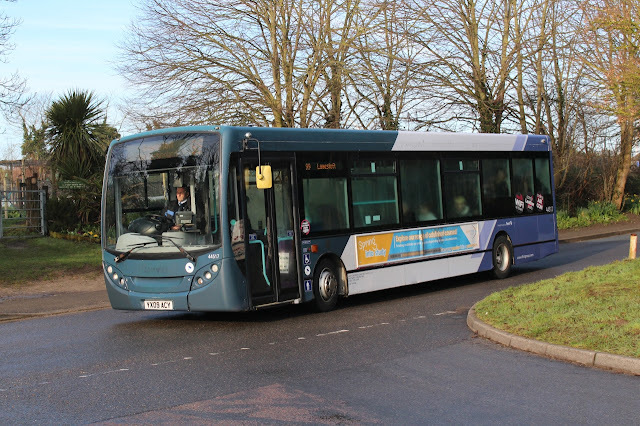 The report gives details of the replacement of many Stagecoach Norfolk services by West Norfolk Community Project Limited. 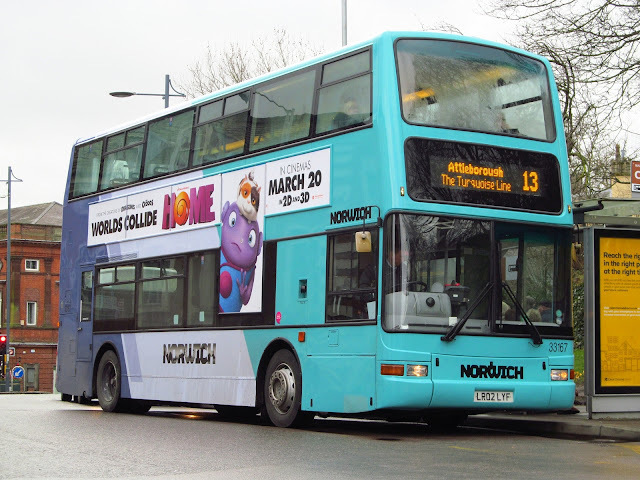 One entry includes a Monday to Friday Fakenham to Easton College route from 30th April 2018, running on college days only. Coastal Red (Lynx) has also made applications to provide a daily 36 Fakenham to Wells-Next-the-Sea service, operated on an hourly basis, plus the two hourly Kings Lynn to Fakenham. 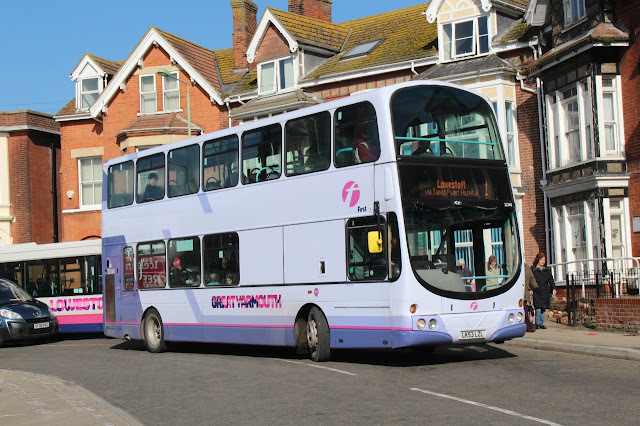 It is also to amend the timetable of its 36 route connecting Hunstanton with Wells-Next-the-Sea. All changes are to start from 29th April 2018. Grahame has informed me that two First Great Yarmouth deckers have moved south to Lowestoft on loan. They are Volvo B7TL 32210 (LT52WTR) and B9TL 36185 (BN12JYH). Grahame's photo shows BN12JYH leaving Lowestoft on the X2 service to Norwich this morning. From Easter Sunday, the summer Sunday hourly timetable on the 99 service to Southwold begins and is expected to operate until September. After my return from a short break in the southwest, I have a number of post to catch up with and my latest is an update on First Norwich fleet. As you may have seen elsewhere, the second batch of Volvo B9TL's arrived at Roundtree Way yesterday from First Leeds. I understand that two of them are shortly to visit Simon Morris for a new style yellow line branding. The only bus to appear in service from Leeds so far is 36272 (BJ12YKE) which has seen use on the 24s and 13s this week. Current yellow line Volvo B7TLs 32105-7 (LT02ZCU-X) are shortly to receive new lilac front ends following their replacement on the 28 and X29 routes by five of the former Leeds B9TLs. 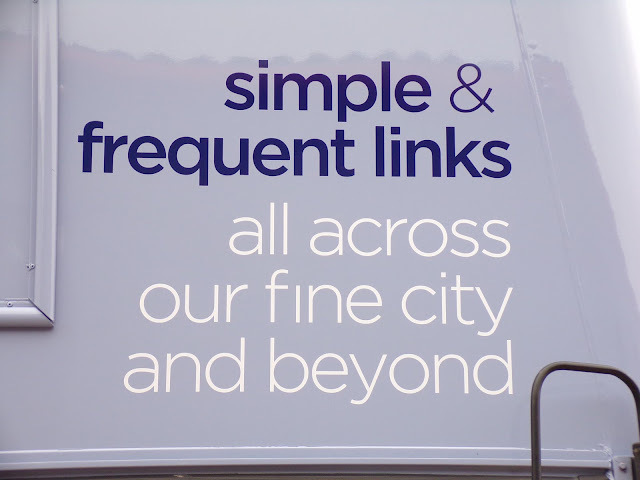 This is part of an ongoing plan to upgrade all the routes one after another. This also means the yellow saloons will look different too with at least one probably having a lilac front end. 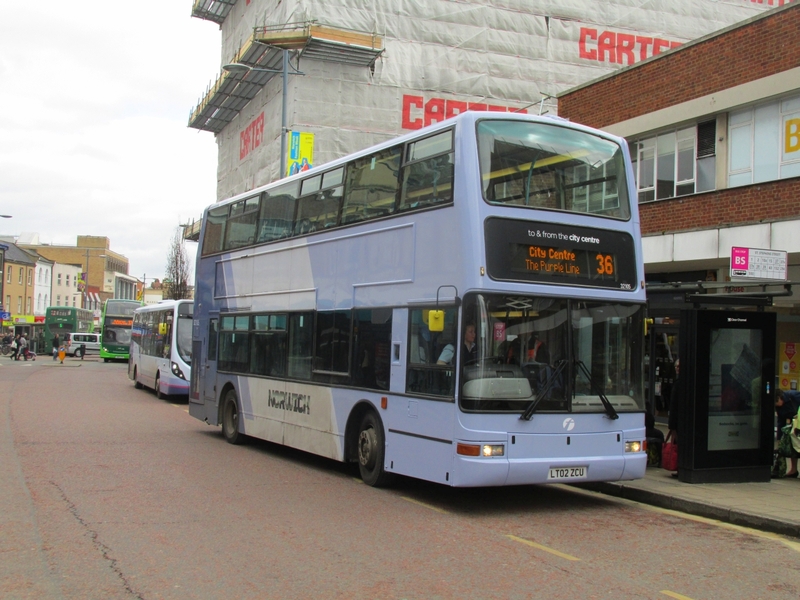 Turquoise line Trident 33167 (LR02LYF) has also made its way to Ipswich to receive the new plain livery with a lilac front, as seen elsewhere within First Group. Lilac buses are being allocated to workings which operate more than one route during the day or evening. My thanks to my contact at First for the update and to Zak Nelson for the use of his photo. 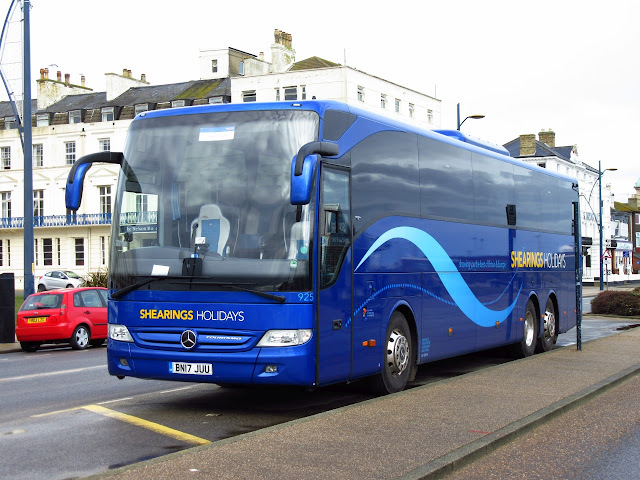 Just the one Shearings visitor noted on Great Yarmouth Seafront this morning, MB Tourismo 925 BN17JUU was noted parked opposite the Carlton Hotel. 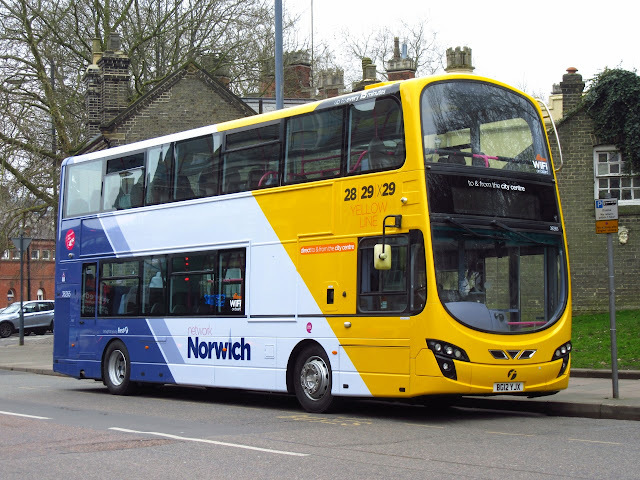 The first Trident has been cascaded out of the Norwich Fleet due to the pending arrival of eight Volvo B9TL's from First Leeds. 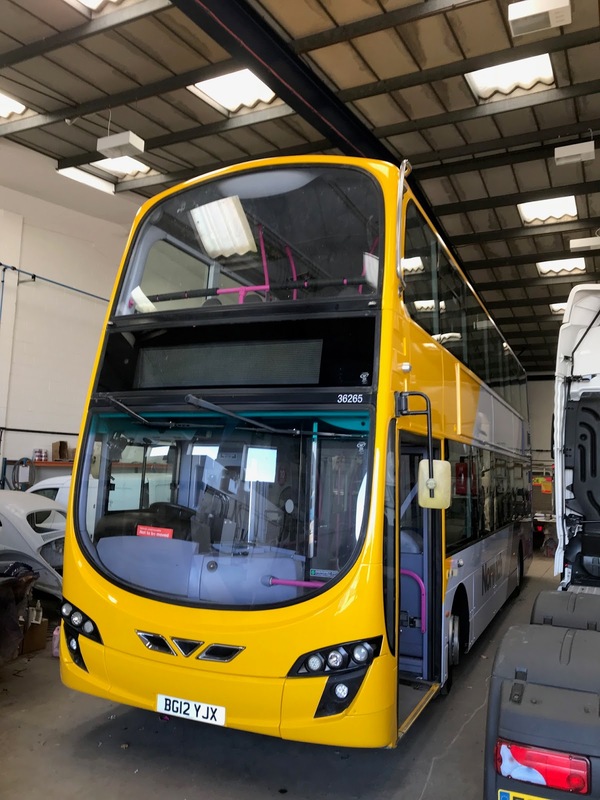 33236 LT52WWZ has made its way to Cambourne Depot in Cornwall. 36269/70/71/72 Have all arrived in Norwich and are currently at Roundtree Way Depot being prepared for service. The first sighting was outside the Sealife Centre in Great Yarmouth where Grebe Coaches Mercedes Benz midicoaches MIL5166 and MIL3520 were picking up school children following their visit to the seafront attraction. Making my way home, I noticed a coach at the railway station on rail replacement dutyfollowing train cancellations. Standing in was Angies Tours' Neoplan Transliner T777GSM - formerly with Sunbeam Luxury Coaches of Hevingham, near Norwich. The coach still retains its former owner's embellishments. A surprising haul as I originally set out not expecting to see anything of interest!